You're so full of surprises, I'm speechless. Smack dab in the middle of my afternoon jog yesterday, I came to a sudden, significant self-realization: I have not cried outside of a movie theatre in five years. The last time I became emotional to the point of tears was after a crunch period in my first year of university; writing final three papers simultaneously one night proved to be the trigger, and I lashed out at a family member only to break down, overwhelmed with guilt and exhaustion. I feel fairly certain that this is the last time I cried with such force, in public, for reasons completely unrelated to any cinematic experience. More and more, escaping in film is becoming the means of expressing emotion for me, and I don't know if this is a good thing or bad. It's not a problem of being unable to cry: only that I can't do so in "real life". Indeed, I can recall plenty of times that I've welled up at the plight of a character or a collage of sights and sounds with relative ease, but am hard-pressed to recall a similar reaction in any other context. I wept throughout all of Satyajit Ray's Pather Panchali, possibly my favourite film of all time. A second screening of The Fountain - a film which I found hokey and vague the first time around - hit me hard for reasons that are still unclear to me. Watching Mira Nair's adaptation of The Namesake was jarring only because it's rare to see my experiences reflected so precisely in a cinematic medium. Stories about first-generation South Asian-Americans or Canadians negotiating identity, family relations and history are, to put it mildly, not "hot" properties for film companies today. Most recently, Persepolis had me giggling through my tears, moved by Marjane Satrapi's nakedly honest reflections about her early years situated across several countries and cultures. Essentially, the cinema hall has become - for lack of a better word - my confessional, and everything I want to suppress and hide emerges in full-force. I suppose it's the only place where I feel comfortable doing so. The darkness and insularity provides a sanctuary for anonymous, private grief. And this is why it is hard to convince friends, family members and others in my life that film is more than an interest or hobby for me. It allows me to breathe, escape, and function. Without it, I don't know who I am. Perhaps some of you may be wondering why this should be cause for concern? I suppose I am over-thinking this to some degree, but when I look back on my childhood, I am struck by how emotional I was in my early years. Even watching wedding videos of my aunts' marriages at the age of six was enough to send me over the edge, and I would have to leave the room and beg an adult to turn off the television (the sight of a bride leave her father's house is always a tremendously sad moment for Indian families.) 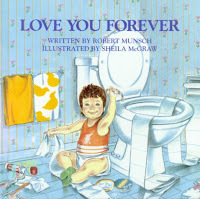 I would collapse into sobs at the end of Robert Munsch's book Love You Forever, every time, because I had this intense fear of my mother dying and feeling powerless to protect her. Attending funerals, having heart-to-hearts with friends, thinking about those who had passed on - these all used to stimulate the waterworks. Part of growing older allows a person to feel more secure about themselves and the world around them. Of course, I don't miss being a nervous wreck all the time, but I do miss the part of myself that was able to feel so completely and unreservedly. I'm afraid I've lost that part of myself, or become closed off from expressing it in relation to other people in my life. Obviously, powerful art has this kind of effect on all of us, and it is certainly clear why we are so absolutely invested in film. Thinking back, I've probably done this to protect myself from the ridicule and scorn of others. I was constantly criticized for being so emotional, for not being "tougher" and less sensitive. As such, most of my teenage years were spent trying to prove my "stability" and sensible nature, throwing myself into schoolwork and other activities. ... Hm. I'm clearly going to be thinking about this for weeks on end. What about the rest of you? Major grievance: who was in charge of choosing the clips this year? Were they even watching the precursor races this season? Fact: Daniel Day-Lewis had some great moments in There Will Be Blood beyond "I've abandoned my boy! ", and the Academy would have earned points if they boldly went with milkshake fun. Ditto for Ronan's "Yes, I saw him with my own eyes", Bardem's "Friend-o" and Blanchett's "I'm a hurricane or tsunami or whatever." And out of one-hundred-and-two minutes of running time, why did they have to choose the Norbit make-up clip in which Eddie Murphy plays an offensive Asian stereotype? Finally, unless you were watching the Red Carpet arrivals on CTV, you probably missed this keeper: Ben Mulroney *totally* got burned by Julian Schnabel, but to be perfectly honest, the grating entertainment guru had it coming (the co-host of eTalk Daily and son of former Prime Minister Brian Mulroney, he's the equivalent of a Canadian Ryan Seacrest.) He called The Diving Bell and the Butterfly and Before Night Falls "triumph(s) of the human spirit", to which Schnabel responded curtly, "That sounds like a cliché." Mulroney countered with something along the lines of "Well, clichés can often be true! ", but Schnabel, eyes rolling, had already walked away mid-interview. 2. A few of my fellow bloggers have already made closure with the year that was 2007 and have posted predictions for next year's awards season. Just skimming over these makes my head spin, but the Oscar addict within has obviously been sparked. Milk and Revolutionary Road seem like popular predictions, which surely means that one of these will falter at the finish line. Is it just me, or does Doubt look like another Proof in-the-making? Adaptations of heralded plays rarely find favor with Oscar, although I suppose that the drool-worthy cast makes a big difference. I'll agree with Streep and Adams (for now), but I'm thinking snubs in Picture/Director/Actor/Adapted Screenplay. 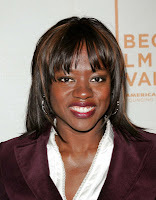 By the way, can I just say how pleased I am that the amazing Viola Davis is returning to the big screen in two films this year? This woman can do miracles with minutes - nay, seconds - of screen-time. (a) I don't see the Heath Ledger posthumous nod for The Dark Knight happening. (c) ...unless Julianne Moore gets nominated for Blindness; then which Oscar bridesmaid will the Academy rally behind? 3. As if this past week hasn't been euphoric enough for rabid actressexuals everywhere, Nick Davis of Nick's Flick Picks has unveiled his long-in-the-making project ("The Best Actress Academy Awards") rating, ranking and celebrating Oscar's favorite Lead Women. Most people who read this blog will likely already know about this delightful development, but if this somehow comes as news to you, off you go! I have spent 95% 40% of my weekend reading his yearly profiles, and feeling shamed about how much catching up I have to do. But I will certainly be using Nick's recommendations as a guide on where to start, and if you're feeling relatively newbie, so should you. 4. My friend Alex and I have recently established a movie-going tradition: if anything in the "step-to-rep" genre (my coinage) is released theatrically, we are all over it. Preferably on opening night, to view it with audience members who actually like this sort of thing. What began as an experiment with the god-awful Step Up has continued with classics such as Stomp the Yard and most recently Step Up 2 the Streets. It is only natural that getting to know people should take some time. Everyday, I watch for the old man with the flowers. And I wonder... was he born here? Did he love someone here? Did he lose someone here? He doesn't seem as curious about me, but that's all right. These days, I'm something of a loner myself. I'm pretty good at staying entertained. Mostly, I like to hang out at a little bar I know, conveniently located in my backyard.